Customizes the Eclipse CDT build environment variables for all projects in the workspace; it lets you control the environment variables used by the build to for the purposes of building the selected configuration. 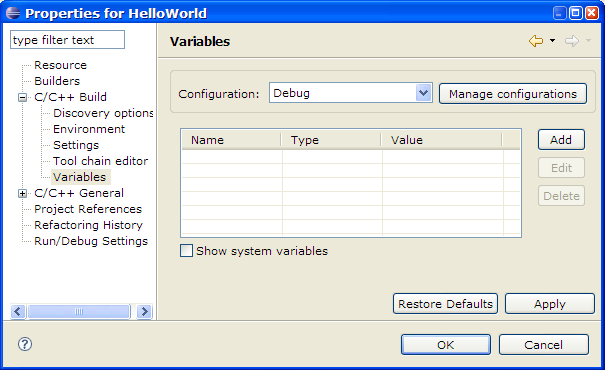 Environment variables to set Shows the current list of environment variables and their corresponding value. These are the environment variable values used when running an application. Manage configurations Click here for a description. (The variables table) Lists the CDT build variables and system variables, by Name, Type, and the Value. Custom Build variables are identified by the name being highlighted using a bold font. Name Indicates the name of the variable, either a user defined variable or a system variable. Type Shows the type for the variable. Value Specifies the value of the variable. Show system variables When selected, system variables are included in the Variables table; otherwise, they are excluded so that only user defined variables appear in the Variables list. Add Creates a new variable and corresponding value. Edit Modifies the name and value of the selected variable. Delete Removes the selected variables from the list. Note: Some variables are read-only and cannot be removed.